This dissertation investigates the phenomenon of multifunctionality, i.e. the ability of a linguistic element such as a word or a morpheme to acquire a number of different functions depending on the syntactic environment in which it surfaces. The author approaches multifunctionality from two perspectives. The first perspective is concerned with the question of what theoretical framework serves best to account for multifunctionality phenomena. Comparing a number of different frameworks in Generative Grammar, the author proposes an innovative eclectic approach that combines fundamental insights from Minimalism, Distributed Morphology, the Exo-Skeletal Model, Nanosyntax and the Universal Spine Hypothesis. The second perspective is concerned with the empirical domain. 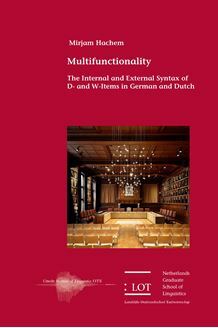 The author uses d- and w-items from German and Dutch as a case study on multifunctionality and investigates both the internal structure of these elements and the individual syntactic environments in which they surface. It is shown that all the investigated elements can be analyzed with one functional sequence. The distinction between d- and w-items arises at the top of this sequence. It is only the topmost head of the sequence in which they differ. In the lower domain of the sequence, the author proposes to analyze gender morphology of pronominally used d- and w-items as an expression of mass classification. Gender is consequently not regarded as a purely grammatical semantically empty category but as a tool to create mass distinctions. This hypothesis is supported with both synchronic and diachronic data. With respect to the multifunctional behavior of d- and w-items in German and Dutch, the author shows that each function can be derived from the syntactic configuration in which the individual element surfaces. This study is of relevance to scholars working on multifunctionality phenomena, comparative Germanic syntax and morphology, pronouns, gender, temporal and spatial adverbs, as well as fundamental issues in Generative Grammar.